I bought this on cassette in the early 80’s. This da one made me a Toots fan forever! It’s an all time feel-good favorite album and goes a long way towards explaining why I’m such a fan of classic reggae. I’m not familiar with all of Toot’s work, but this album brilliantly illustrates for me how Soul Music and the Memphis sound were influences on Toots. It’s not my original thought; it’s been said elsewhere. What he comes out with is far from derivative – it’s like a brilliant echo. Check out my other postings on Sam and Dave – compare for yourself. 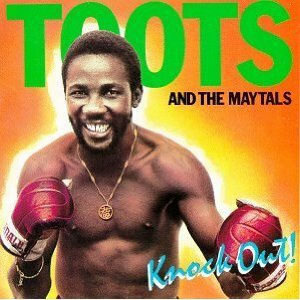 And then just think about the influence of reggae on American and world popular music… Toots, is an originator, yo! This album seamlessly and slyly incorporates pedal steel guitar on some of the tunes – one of the slickest and most effective uses of the pedal steel I’ve ever heard. It speaks volumes to Toots’ musicianship and his openness to other influences. The production values on this album are a remarkable achievement. There’s lots of well integrated organ playing throughout – very bubbly. There’s a beautiful cycle of songs about relationships. “Beautiful Woman” is a hilarious tongue in cheek cautionary tale about the perils of beautiful women. In “Spend The Weekend”, he’s fed up and asks his partner to go “spend the weekend with your mother”. “Two Time” is a classic been-done-wrong song, an eloquent mix of smoky anger, paranoia and plaintive vulnerability, using echo to heighten the tension. In “Missing You” Toots gets the heart ache. It’s a beautiful song about heartbreak, as only Toots could sing it. “I Know We Can Make It” is a percolating request for his partner to stick by him… it would be hard to resist! “Careless Ethiopians”, “Revival Time” and “Never Get Weary” are nice statements about his faith and beliefs. “Never Get Weary” exemplifies the indomitable Jamaican spirit in the face of poverty and racism, a powerful indictment against colonialism’s slavery past. All of these songs can be purchased as MP3s at Amazon and found on YouTube or MySpace. The CD is sadly out of print and it can only be hoped that the powers that be are persuaded to re-release this lost masterpiece – with decent mixes. It hangs together seamlessly as a whole and the sum effect is greater than the parts. They sure named this album right, though – this album is a Knock Out!